I get a lot of credit for the being creative one in this outfit. After all, I’m the stay at home mom who likes to bake, sew, draw, write and act while Daddy-O is a former middle school math teacher currently working as a computer tech. 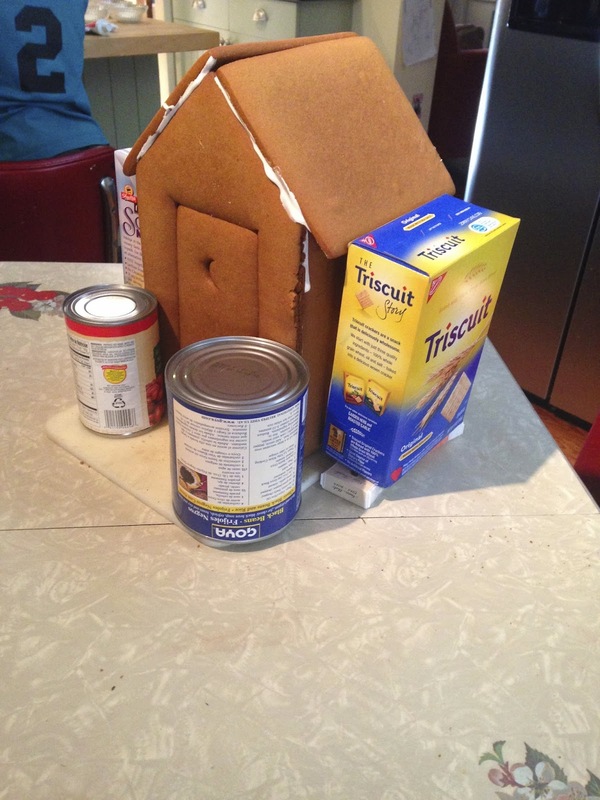 So it usually surprises people to discover he's come up with all of our favorite family traditions, like showing films on a screen hung on the outhouse in the yard over the summer (aka Outhouse Theatre) and making a gingerbread house on Thanksgiving. 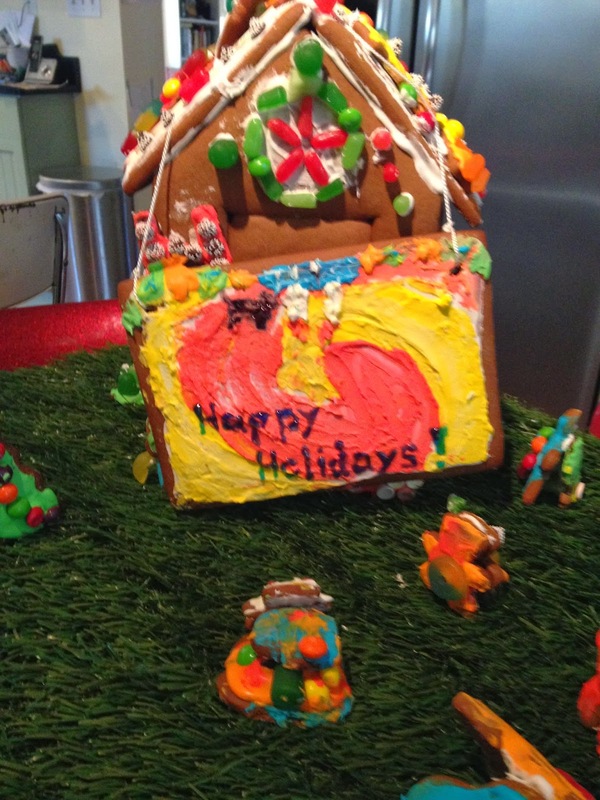 I realize a lot of families make a gingerbread house for the holidays but like with a lot that we do around here, we like to take it up a notch. For us that means from-scratch gingerbread and icing (all done by Daddy O), outrageous themes and lots of candy. 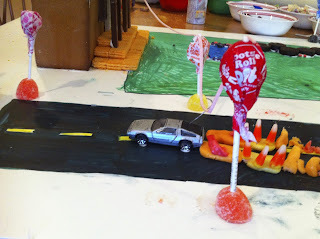 I think my favorite was last year’s “Back to the Future” gingerbread diorama, complete with miniature DeLorean outfitted with a hook on top, hitting the bubble tape cable and leaving candy corn flames in its wake. Boy on skateboard, check. Car, check. Truck full of manure, check. 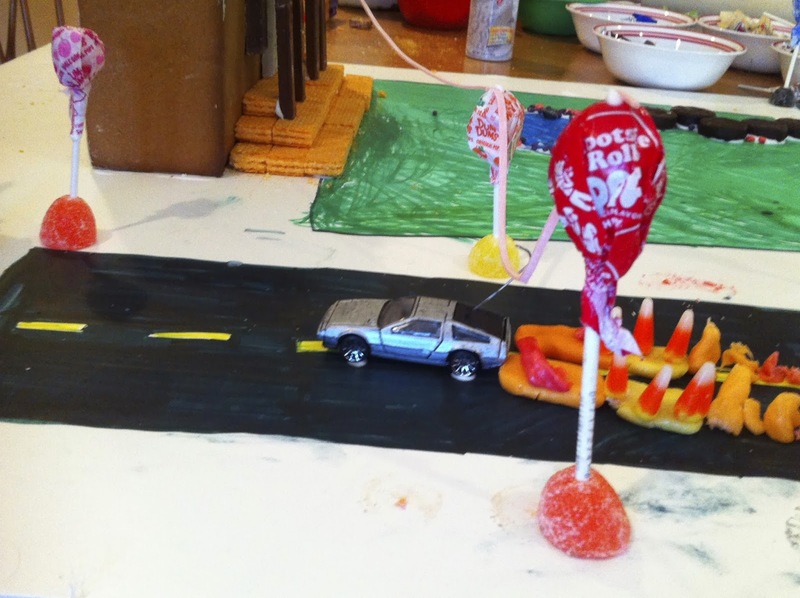 We knew that it was going to be hard to top last year's creation. There were a lot of ideas thrown around, from Hobbit hole homes to the TARDIS but once again Daddy-O came up with a great idea: an outhouse. I loved it, a combination of two of our very fun and unique family traditions. 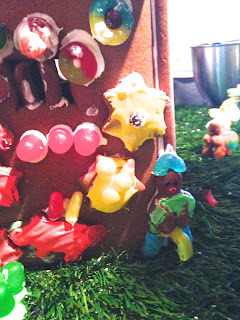 This little gingerbread man was baked with crossed arms to indicate that he had to pee and was waiting for the outhouse but when it came time to assemble, it was decided that the poor little man couldn't wait anymore and had to pee (a yellow squishy life saver) right there on the side! Poor dude. And here it is! 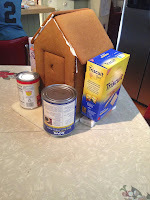 Our Gingerbread Outhouse with a movie screen hung on it showing The Wizard of Oz. Of course, one of the best parts of this tradition is smashing and eating it. We have a party with good friends every December where the kids gather around and destroy and consume all that hard work. And every year it's totally worth it.